This will be only the second time the vouchers have been sent to city residents after the first-in-the-nation program debuted in 2017. Funded by a 10-year, $30 million property-tax levy, the program is meant to engage more people in the electoral process and help grass-roots candidates compete. It made national headlines in 2017 and appeared to diversify Seattle’s donor pool, as residents spent $1.14 million in vouchers on candidates for council and city attorney, though corporate money continued to flow through independent political committees. Two local property owners who brought a lawsuit against the program were defeated in King County Superior Court, but the state Supreme Court recently agreed to review the case. The council made some tweaks to the program for 2019. The vouchers are being mailed in February this year, rather than in January, for example. At this point, 25 candidates have made themselves eligible to collect vouchers by pledging to abide by the program’s rules. Only two — Alex Pedersen and Logan Bowers — already have qualified to spend voucher money by collecting 150 signatures and $10 contributions from residents. 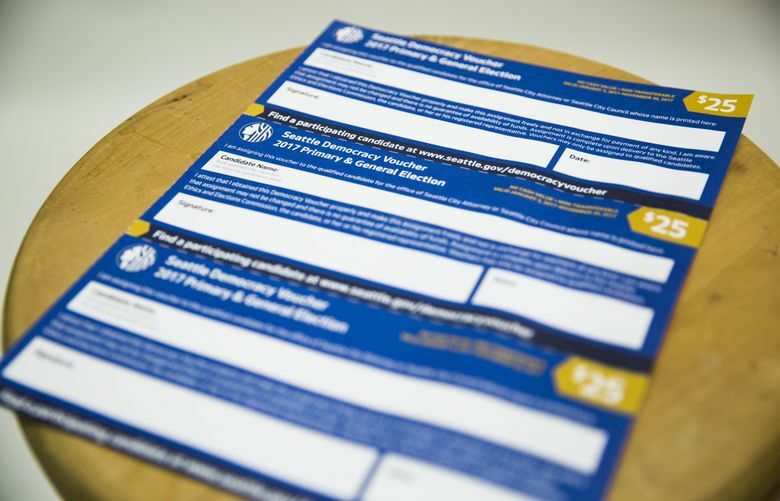 Residents can use their vouchers by submitting them to a candidate’s campaign, to the Seattle Ethics and Elections Commission or at a drop-off location. On Feb. 28, the commission plans to launch an online portal for the program where residents will also be able to access their vouchers.